Objective studies show significant hair reduction after as few as 3 to 4 bi-weekly treatments, resulting in smooth, hair-free skin. To maintain results, touch up every 4 to 8 weeks. It has its own specially designed extra integrated filter and a small, flat window for gentle and precise use on the upper lip, chin and jawline - 2 cm2 window size. 84% of women satisfied with hair reduction on face. Large, curved-in design to follow body contours thus effectively covering areas like the legs, arms and stomach. Also enables fast treatment on large body areas thanks to the largest treatment window (4.1 cm2 window size). 83% of women satisfied with hair reduction on legs. With Intense Pulsed Light technology, gentle pulses of light are applied to the skin and absorbed by the hair root. The lighter the skin and the darker the hair, the better the pulses of light are absorbed. The pulses of light stimulate the hair follicle to go into a resting phase.As a consequence, the hair sheds naturally and hair regrowth is prevented. The cycle of hair growth consists of different phases. IPL technology is only effective when the hair is in its growing phase. Not all hairs are in the growing phase at the same time. This is why we recommend you to follow the initial treatment phase (4-5 treatments, every treatment 2 weeks apart) and then the follow-up treatment phase (touch-ups every 4-8 weeks) to make sure all hairs are effectively treated in the growing phase. 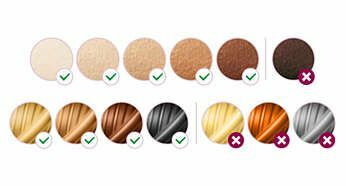 Lumea provides 5 different light intensities and advises you on the right setting you should use based on your skin tone. You will always be able to change to a light intensity setting you find comfortable. 1. Press the on/off button to turn on the device. The device starts to operate at light intensity setting 1. Note: To adjust the light intensity setting manually without using the skin advice, use the toggle button until you have reached the required setting. The corresponding intensity light level lights up white. 2. Press the SmartSkin sensor ( ) and put the device to your skin. 3. After the device scanned your skin, the suggested intensity lights will blink white to indicate which intensities you can use based on your skin tone. 4. Press the confirmation button ( ) to confirm that you want to use the suggested setting advice to start using the device. Philips Lumea will automatically use the highest suggested intensity, indicated by a continuous lighting led indicator. Lumea gives you the freedom to select the light intensity that you find most convenient. If you want to set the light intensity setting manually, please consult the table below. This table shows settings that for the majority of users provides a comfortable, but still effective setting. 5. Using Lumea should never be painful. If you experience discomfort, reduce the light intensity setting. You can do this by using the up-down buttons. 6. 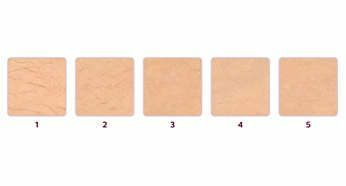 After moving to another body area or recent tanning, perform a skin test to determine the right light intensity setting. To re-activate the setting advice feature, press the magnifying glass symbol. Is Lumea IPL hair removal suitable for me? Philips Lumea Prestige works effectively, easily, and safely on a wide variety of hair and skin types. It works on naturally dark blond, brown and black coloured hairs and on skin tones from very white to dark brown. As with other IPL hair removal based treatments, Philips Lumea cannot be used to treat white / grey, light blond or red hair and is not suitable for very dark skin*. This is due to the high contrast required between the pigment in hair colour and pigment in the skin tone. Philips Lumea has been developed with your safety in mind and does not hurt your eyes. What differs between salon and at-home treatments? 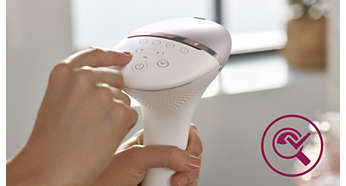 Philips Lumea IPL technology is derived from the technology used in professional salons. We have, however, adapted the technology for safe and effective use at home. 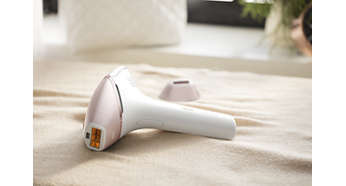 Philips Lumea is equipped with a high performance lamp, which does not require replacement, so that you can continuously maintain results for many years to come. IPL contains a broader spectrum of light (like a photo flash) while laser emits a single beam of light (like a laser pointer). As a result of the single beam of light the laser treatment might be perceived painful. Furthermore, laser treatment usually requires a longer treatment time, as the treatment window size is smaller than with IPL devices. Yes. Philips Lumea has been optimised for use by women, but can be used by men as well. Does the Philips Lumea treatment hurt? 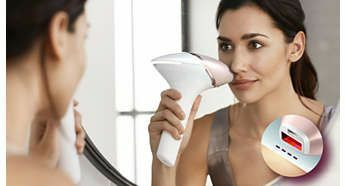 In the extensive amount of (clinical) research carried out into the Lumea, no women rated the experience as painful, providing that correct settings, according to skin tone and hair colour, were used. To ensure that the light energy is channelled to the hair root in the most efficient way and not lost in the hairs above the skin's surface, body hair has to be removed. However, pre-treatment is only necessary while hair is still visibly growing back. What is the difference between Slide & Flash and Step & Flash mode? This mode is to treat large areas (e. g. legs). You do not need to lift the Lumea between flashes. Instead you just slide it over the skin while holding the flash button pressed throughout the application – it will flash as you go. This makes the treatment of large areas easier and faster. This mode is for small and bony areas that are more difficult to treat (e. g. knees, armpits). Place your Lumea on the skin, release a flash, lift it off from the skin and move on to the next area. How does the SmartSkin sensor feature work for Lumea Prestige? The SmartSkin sensor helps you choose the right setting. Since body areas might differ in skin colour, please consult the SmartSkin sensor for each body area separately in order to use the right setting.